Ten people, strangers to each other, are invited to a remote island for a holiday weekend. Once there they are each accused of a crime, a murder, for which they had never been charged. As one after another guest is found dead, paranoia reigns, as the remaining people on the island suspect one another and fear for their lives. And Then There Were None could be viewed as the precursor of modern horror movies, where each character is bumped off in succession. It was also spoofed in the classic comedy film Clue. The book, although ingenious, is a bit of a downer. 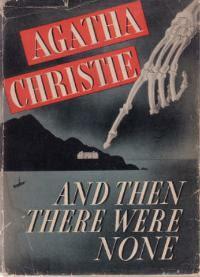 Clearly even Christie thought so herself, and changed the ending when she adapted her novel into a play in 1943. 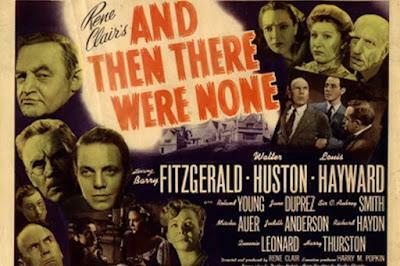 That ending is followed in the 1949 film version of the tale, And Then There Were None, directed by Rene Clair (which I recently viewed and liked on Amazon Prime). I prefer that take on the story, although a more by-the-book adaptation was recently filmed in 2015, starring Aidan Turner. 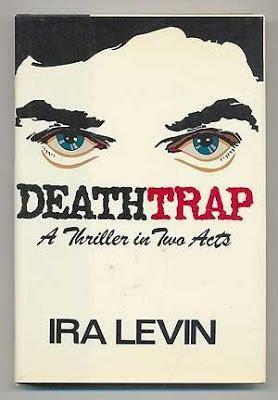 Continuing my Ira Levin binge, my local library had Deathtrap: A Thriller in Two Acts. I had only seen the movie version, starring Michael Caine and Christopher Reeve. Maybe taking a nod from Ms. Christie, there is really no innocent person in Deathtrap. A twisty-turny puzzle of a play, Deathtrap centers on playwright Sidney Bruhl, whose last play was a huge flop, and who seems burnt out, humiliated, and out of ideas. A draft of a play is sent to him by a former student, and a diabolical light bulb goes off over Sidney's head ... as he tells his wife, Myra, "It is a thriller in two acts. One set, five characters. A juicy murder in Act One, unexpected developments in Act Two. Sound construction, good dialogue, laughs in the right places. Highly commercial." Levin has a ball winking at the audience, and the play, written in 1978, was deservedly a big hit on Broadway. It reads well, too. This is an eclectic collection of stories by the author of What Dreams May Come and Stir of Echoes. The title story has been adapted twice - as a Twilight Zone episode and a feature film, The Box. I have yet to see either one, but I liked the story, which features a fun and creepy twist ending. Another of the stories in the book, "Dying Room Only," is a great, tense read, but may discourage the reader from ever stopping again at an out-of-the-way spot to grab a bite while on a road trip. Most of the stories were written and published previously in the '60s and '70s. They are a bit of a mixed bag - some good ("Clothes Make the Man"), some humorous, some dated ("The Creeping Terror"), some some just strange ("A Flourish of Strumpets," "'Tis the Season to Be Jelly"). Button, Button is a diverting read, but makes me wish the library had I Am Legend or Hell House instead. Agatha Christie's most famous detectives were Hercule Poirot and Miss Marple. But she also wrote five books featuring the detective couple Tommy and Tuppence Beresford. They met in The Secret Adversary (1922), were married in the collection of short stories Partners in Crime, on the track of German spies during WW2 in N or M? 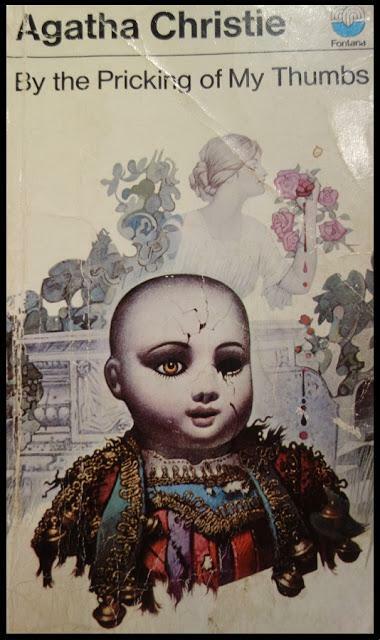 (1941), were retired with grown children in By the Pricking of My Thumbs (1968), and elderly in the last novel she wrote, Postern of Fate (1973). In By the Pricking of My Thumbs the Beresfords visit Tommy's elderly Aunt Ada in a nursing home. While Tommy is with his aunt, Tuppence meets a strange old lady, Mrs. Lancaster, in the common room, who points at the fireplace and asks her, "Was it your poor child?" The next time they visit the home Aunt Ada has died and Mrs. Lancaster has disappeared. The title comes from Shakespeare's Macbeth: "By the pricking of my thumbs, Something wicked this way comes." She is not kidding. This is one of Christie's creepier mysteries. It is also, like its writer and her detectives, a little bit older and unfocussed. But there are enough thrills and a truly sinister ending to make this book not one of her greats, but definitely worth a read.